This amazing blue and red birdhouse proves to be the perfect gardening gift and garden accessory. Ingenious and beautiful, it'll be the centerpiece of your backyard. And you probably hardly see the same one anywhere else in the area! Making your garden as attractive and safe as possible for nesting birds will eventually result to those much awaited settlers. it can also be put on a poll. We founded RedCube LLC with one simple goal: to provide amazing jewelry and stylish accessories as well as useful and necessary things in domestic life at great prices. We're 24/7 and always bringing something new for less. RedCube LLC provides FAST, FREE and EASY returns and a 100% money-back guarantee in case you are not happy with the items you receive. Speedy, hassle-free shopping just got even better. A bird feeder can help birds find food and build nests when conditions are tough. Setting this bird box up in your garden will help the bird population, and can add a touch of style and to your yard. It is particularly useful in colder areas. Simple to set up, inspect and clean. Strong, durable and attractive to birds. Made of plastic, provides insulation and ventilation. Suited to all weather conditions. Put up this feeder to provide an additional food source for birds and a place to raise their young! This box is suitable for mounted on trees or nestled deep inside shrubs. Spacious and useful, it'll not only attract wildlife to your garden, but also add a touch of style. Dimensions: Length - " , Width - ", Height - ". RedCube is a registered trademark. This item is ONLY fulfilled by Amazon and seller "RedCube LLC". 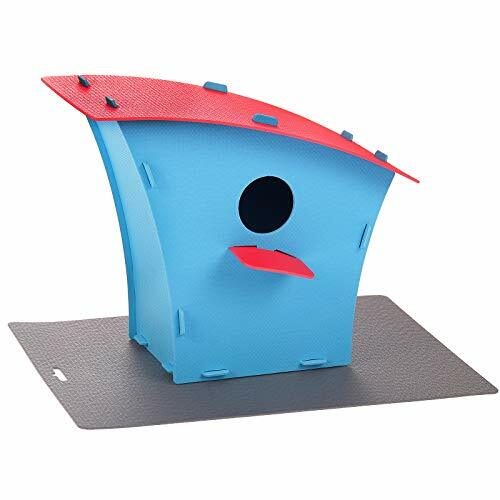 When you're looking for a great birdhouse, or shopping for other accessories online, RedCube LLC is your number one place to shop. We're proud to say that we've shipped a massive amount of items all around the globe. We offer a 30 day returns and refund guarantee on all items. Email us 24 hours a day. Our customer care team is here to help you! If you have any questions about this product by Red Cube, contact us by completing and submitting the form below. If you are looking for a specif part number, please include it with your message.